Over the past 6 months I have been migrating from Wunderlist to Omnifocus 3 Mac. I’m confident OF is a better place for my GTD workflow. However, I find myself missing one critical feature of Wunderlist, which is the ability to track a history of (timestamped) comments on an item that allow me to take notes on work performed to date. Welcome to Omnifocus! I have used Wunderlist myself and liked it, but it soon became too limited. You will not have that problem in Omnifocus, I can assure you. It’s elegant if every comment in Wunderlist gets its own comment. As every task in Omnifocus only has one note field, it would be hard for Omnifocus to know when to set time stamps. You could of course do it manually, either by using the menu command Edit/Insert Time Stamp or by using a utility such as Keyboard Maestro. That’s what I do. On the other hand, if you settle with one note per task (and for example putting related tasks together in action lists), there are time stamps for Added and Changed in each task shown in the inspector. I would be careful with using those for tracking comments, though, as any other change in the task, not related to the comment, will update the date for Changed. I have lots of manual, messy, misordered notes from doing this in OF notes. It’s the simplest solution if you can tolerate the clutter. You can use a note-taking app that supports formatting and rich media (e.g. photos, videos). These notes can be shared (e.g. with other people going on a vacation), assuming the notes app you’re using supports it. These notes may be useful again in the future (e.g. when planning next year’s vacation) and it’s not always very convenient to get to complete things in OmniFocus, especially if they’ve been archived. The notes field is still useful for information that you want to have at your fingertips when you’re stepping into action. And, you could include links to notes with more information, assuming this is something that your note-taking app supports. You can also link to OmniFocus actions and projects, so could include a link back to the OmniFocus action/project within the note to create an easy way to jump between the two apps. p.s. 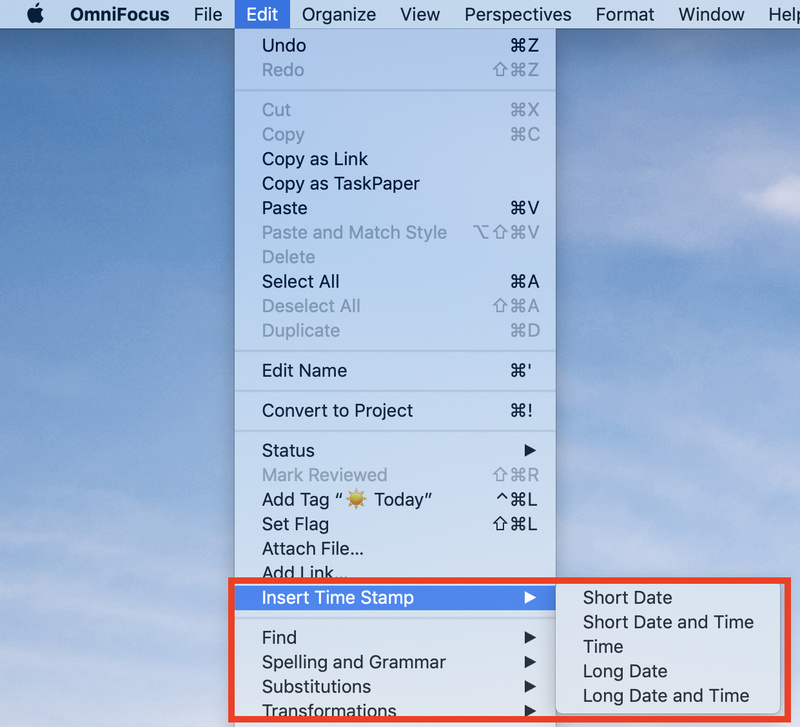 If you do any up logging any info in OmniFocus itself, there are some Insert Time Stamp commands in the Edit menu may be helpful. You could assign a keyboard shortcut (using System Preferences > Keyboard > Shortcuts > App Shortcuts) to those that you use frequently. Good to hear this was helpful, @ek7832! If you haven’t already, I encourage you to email your feedback/request to the Omni Group by choosing Contact Omni from the Help menu in OmniFocus. I have a TextExpander shortcut set up so that when I type “qq” I get output like “2019-03-26 15:15:01”. Not sure why I chose “qq” but it has stuck. So, I can quickly type that shortcut and get a timestamp anywhere. I agree, though, it would be great to have a history of task comments automatically created. This is exactly the kind of thing I suggested should not be stored in OmniFocus in my Inside OmniFocus story: somewhat cheekily titled Outside OmniFocus. There are a bazillion tools for revision tracking—why use a hammer to push your needs into OmniFocus? The article suggests a few ways of making sure that OF has all the data you need to stay organized, but doesn’t make you jump through hoops using a poor tool for your needs.